Alert: This post contains no technical information. It is provided as a stimulus for thinking only. The reader decides if they wish to participate. No answers provided, just concepts to ponder. This particular story is the first in a short chain or related questions to consider or ignore. My understanding of underground and resistance fighters doesn’t come from movies, it is from my 7th grade French class. I attended a small, tough private school that afforded our instructor a chance to share her personal experience. When she was 15 and her sister was 17, living in Paris, they ‘entertained’ German Officers and collected information. Her sister was caught and tortured to death by the Gestapo, our teacher evaded capture. She never said what happened to her family. As a 13 year old, I listened and quietly understood that I wasn’t made of the same kind of flesh and blood as my teacher. The story brought an honest humility that prevented any daydream that I inherently had the same courage. For a young man it was an uncomfortable awareness. As an adult, I was glad to have traded hollow bravado for a realistic understanding and appreciation of the fact some humans can control their fear better than others. I also understood one couldn’t generalize who they were by appearance or claim, just by their deeds. 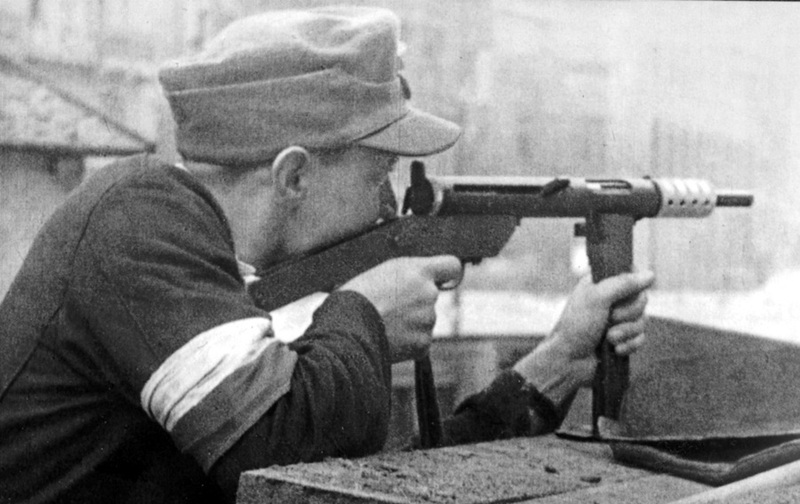 Above, A Polish youth, fighting to the death against the German SS during the 63 day Warsaw Uprising in 1944. His submachine gun is a “Blyskawica” an ingenious all-Polish design made by the hundreds in advance of the uprising, right under the noses of the German occupation force. The resistance fighters killed over 8,000 German soldiers in savage fighting. They had hoped to liberate the city, timed just as the Soviet red army arrived. The Soviets halted and allowed the Germans to exterminate the resistance, because it eliminated most of the potential post war Polish democratic leadership, and made way for the Soviet puppet government. Churchill and the west were outraged, but powerless to force Stalin on the issue. Arguably, this is the first move of the Cold War. People debating private firearm ownership today can hardly restrain themselves from trying to draw parallels to resistance to the Third Reich, and what effect it might have had. The discussion is never nuanced, and it ignores the most obvious factor, people living today are mostly marshmallows addicted to IPhones, a different species than Poles in 1943-44. There is an often cited American anti-gun ‘study’ which claims private gun ownership in Europe would have been meaningless, and the resistance in Warsaw only killed 20 Germans. The idea that this ‘study’ was written by some modern urban American writer, living in freedom and safety is frankly, repulsive. Everyone can have a point of view, but this is a grotesque distortion of a history which belongs to the memory of some of the most courageous people in the 20th century. The Blyskawica shows how determined the Poles were to be armed, and crucially the number of German dead is from a notorious SS propaganda document called “The Stroop Report”, which is actually about the Warsaw Ghetto Uprising in 1943. No matter how badly I wanted to win an argument, I am not going to resort to intentionally misapplying ‘data’ from Nazi SS propaganda to do it. Can you accurately access your own skills? Pilots are notoriously poor judges of their own skills and abilities. Some have sound training and judgement, but lack confidence, often because an instructor subtly sent the message the student was not trusted. The other end of the spectrum are pilots full of unwarranted self assurance, which prohibits them from honestly assessing their skills in comparison to exceptional performance. When listening to pilots this month, watch for both of these to be present. Determine that you will fall to neither extreme. Set yourself to have skills and judgement, and a realistic measure of their quantity and quality. Is the information presented valid and applicable? Aviation has ‘studies’ and data also, and most of them are not valid. In the consumer world, people understand that ‘studies’ associated with products or ideas are just an extension of marketing, and they are written out of thin air to support a position, sell a product or provide you a preformed opinion. Aviation is no better, and it might actually be worse. Pilots have much larger than average egos, and they do need to be ‘right’. They will frequently find any statistic or article that can be employed to substantiate their old wives tale. Be alert for this when looking for the answer to any honest aviation question. Be selective about information, put effort into evaluating not only its validity, but if it is even applicable to your situation. I was also able to see Dieters story on nexflix a few weeks ago and was very moved by it. Its amazing what affect one persons life can have on so many others. Just read the Wikipedia article, so thanks William and Dan. Wow! And to terminate his own life when he was at the end of the trail, what courage!